The present invention relates to allicin. In particular, it relates to antibacterial, antiviral, antibiotic, antimicrobial, antifungal, antiprotozoal, insecticidal, larvicidal, ovicidal and pediculicidal preparations comprising allicin or an allicin metabolite and a pharmaceutically acceptable excipient. There are also synergistic effects of allicin in preparations further comprising at least one further antibacterial, antiviral, antibiotic, antimicrobal, antifungal, antiprotozoal, insecticidal, larvicidal, ovicidal or pediculicidal. There is also described the use of allicin in the preparation of a medicament for the treatment of multiply drug resistant bacteria. The present invention relates to allicin. is thought to be the principal active compound giving rise to the numerous therapeutic properties which are claimed for garlic (Allium sativium). In the natural state, garlic does not contain allicin, but a precursor, alliin [(+) S-allyl-L-cysteine sulphoxide]. Alliin is converted into allicin by the action of the enzyme allinase or alliin lyase, also a component of garlic. Alliin and allinase are brought together when garlic cloves are cut or crushed. The following equation represents the synthetic route. However, allinase is rapidly and irreversibly deactivated by its reaction product, allicin, and is also deactivated in acid conditions such as the stomach. Thus, in practice, the yield of allicin from a clove of garlic falls far short of the theoretical maximum. Indeed, yields are usually of the order of 0.3-0.5%. WO97/39115 describes a continuous process for the synthesis of allicin by preparing a column containing allinase immobilised on a solid support, passing a solution of alliin through the column and collecting a solution of allicin in the effluent. Allicin is also prepared by the present applicant in spray-dried form and is available in capsules from Allicin International Limited of Half House, Military Road, Rye, East Sussex, TN31 7NY, United Kingdom, under the trade mark ALLIMAX. The present invention is based on investigations into novel therapeutic properties of allicin. In its broadest aspect, the present invention provides an antibacterial, antiviral, antibiotic, antimicrobial, antifungal, antiprotozoal, insecticidal, larvicidal, ovicidal or pediculicidal preparation comprising allicin or an allicin metabolite and a pharmaceutically acceptable excipient. Preferably, the preparation comprises at least one further antibacterial, antiviral, antibiotic, antimicrobial, antifungal, antiprotozoal, insecticidal, larvicidal, ovicidal or pediculicidal agent. More preferably, the further agent is selected from (i) penicillins, including ampicillin, piperacillin, carbenicillin, amoxicillin, methicillin and Penicillin G; (ii) aminoglycosides, including gentamicin, tobramycin, streptomycin and amikacin; (iii) tetracyclines; (iv) macrolides, including erythromycin; (v) cephalosporins and cephamycins, including cefuroxime, cefamandole and moxalactam and (vi) fusidic acid, rifampicin, novobiocin, vancomycin, ciprofloxacin, chloramphenicol and metronidazole. Suitably, the allicin metabolite is at least one of DADS (Diallyldisulphide), DATS (Diallyltrisulphide), ajoene, allitridium or a vinyl dithiin. In one aspect, the present invention provides the use of allicin in the preparation of a medicament for the treatment of multiply drug resistant bacteria. Suitably, the multiply drug resistant bacteria is MRSA (methicillin resistant Staphylococcus aureus); MDRTB (multiply drug resistant tuberculosis), NRSA (Nancomycin resistant Staphylococcus aureus), MRSE (methicillin resistant Staphylococcus epidermidis), PRSP (Penicillin resistant Streptococcus pneumoneae), NRE (Nancomycin resistant enterococci) or NISA (Nancomycin intermediate resistant Staphylococcus aureus). Suitably for oral administration, or administration as a suppository, pessary or nasal preparation, the pharmaceutically acceptable excipient is a solid composition onto which the allicin or its metabolite is bound. More suitably, the solid composition comprises a bulking agent, such as lactose, microcrystalline cellulose or dicalcium phosphate; a thickening agent such as a gum or starch; a disintegrant, such as sodium starch glycolate or cross-linked povidone; a release agent such as magnesium stearate; an emulsifying agent; a surfactant and such sweeteners, fragrances and colorants as may be desired. Most preferably, allicin is bound by a spray drying process and the solid composition comprises a modified starch such as maltodextrin, gum acacia, silica and an emulsifier such as magnesium stearate. Suitably, for topical application, the pharmaceutically acceptable excipient comprises a cream or a soap. The excipient may, alternatively, constitute a lotion, ointment, toothpaste, mouthwash or a hair preparation such as a shampoo, styling gel or conditioner. Such preparations may include a combination of the following as appropriate: surfactants, fragrances, colours, stabilisers, antioxidants, emulsifying agents, thickening agents, waxes, glycerols, fats, suspending agents, de- flocculating agents and antioxidants all of which may or may not be hypo-allergenic. Suitably, a cream excipient comprises white soft paraffin, an emulsifier such as a stearate, suitably magnesium stearate, glycerin, water, yellow soft paraffin and a stabiliser, such as potassium citrate. Most suitably, a cream excipient comprises an aqueous cream, preferably Aqueous Cream BP. Suitably, a soap excipient comprises ether sulphate, cocamide and cocobetaine. Optionally, the excipient may further include fragrances and colorants. Suitably, for oral, parenteral and topical application, the ratio of allicin to excipient is such as to provide an allicin concentration of between 1 and 2000ppm, preferably between 50 and lOOOppm, more preferably between 250 and 500ppm. The above and other aspects of the present invention will now be described in further detail, by way of example only, with reference to following examples. 1. Antimicrobial properties of allicin alone. Determination of Minimum Inhibitory concentration (M3C) by tube dilution Using an aseptic technique, 1ml double strength nutrient broth was dispensed into each of 11 Khan tubes. 1ml sterile deionised water was added to a first tube, Tube 1 (labelled control), lml allicin (2000ppm in an aqueous solution) was added to second tube, Tube 2, mixed using a mechanical mixer and lml transferred from Tube 2 to Tube 3. The process was repeated serially to Tube 11. Hence a double dilution series between 1/2 and 1/1024 was prepared. 4μl overnight nutrient broth culture was used to inoculate each tube. The tubes were mixed and incubated at 37°C for 24 hours. Tubes were observed for turbidity and the lowest concentration with no turbidity was recorded as the MIC. From each of the tubes of the MIC series showing no turbidity, lOOμl was removed and spread onto the surface of a nutrient agar plate using a sterile glass spreader. Plates were incubated at 37°C for 24 hours and observed for the presence of bacterial colonies. The lowest concentration that showed no viable bacteria was recorded as the MBC. A stock solution of allicin VA V/V was prepared by adding 5ml allicin (2000ppm in aqueous solution) to 15ml sterile water. 10ml of this solution was removed, added to 10ml of double strength molten, cooled nutrient agar, mixed and used to prepare a 1/8 v/v dilution plate. The remaining 10ml of allicin (1/4) was diluted with 10ml sterile water to give a 1/8 v/v solution. 10ml of the 1/8 solution was used to prepare 1 1/16 v/v plate. The series was continued until plates with 1/1024 v/v allicin were prepared. The plates were allowed to set and dried at 44°C for 15 minutes. Of the organisms tested, Pseudomonas aeruginosa was least sensitive to allicin and Candida albicans was most sensitive (Table 3). MIC and MBC values have been calculated for allicin and are shown in Table 2. This allicin sample was analysed at a concentration of 2000 parts. Minimum Inhibitory Concentrations determined by multipoint inoculator MIC were determined using a multipoint inoculator (Table 3). The MIC values were calculated assuming allicin at 2000 ppm and the results broadly agree with those obtained in the tube dilution method. The antimicrobial activity of allicin has been demonstrated against eleven microbial species. Relative sensitivities of the micro-organisms vary with Pseudomonas aeruginosa the least sensitive and Candida albicans the most sensitive. Methicillin, (or its related antibiotics) is one of the major drugs used to treat infections caused by Staphylococcus aureus. Methicillin resistant Staphylococcus aureus (MRSA) have emerged as a major nosocomial (infections caused by strains acquired in hospital) problem. The majority of these strains are resistant to a wide range of antibiotics, (including some of the latest). Some are also resistant to agents such as mupirocin, currently used to combat asymptomatic carriage and colonisation in hospitals. In some intensive care units 10-20% of patients may be colonised by MRSA. Diffusion tests determine the susceptibility of isolates to anti-microbial agents by measuring the zones of inhibition around a set measure of the anti-microbial agent. These are still the most common tests used to screen for anti-microbial resistance. Zones of inhibition not less than 6mm smaller than those of a known control strain indicate bacterial sensitivity to the anti-microbial agent. Zone sizes of 12mm or less usually indicate resistance, there is also an intermediate resistance group between these levels. Using these criteria, in the following examples, the clinical isolates were classified as (i) mupirocin resistant, (ii) intermediately resistant and (iii) susceptible by comparing zone sizes to those of an antibiotic susceptible control. 30 clinical isolates and one control strain (Oxford Strain, NCTC 6571) oϊStaph aureus were tested in phase 1 trials. All strains were provided by the Royal Hospitals (Royal London and St Bartholomew's) in London and had been identified as multiply antibiotic resistant. Seventeen of these strains, plus the control, were subsequently selected for phase 2 tests. These tests were primarily used to test the effectiveness of creams. However, the results from the creams were compared to those from garlic and allicin liquids using standard agar well methods. Mupirocin resistance was confirmed using a standard paper disk (Unipath Ltd) diffusion test. Muller-Hinton agar plates were inoculated (lawned) with a standardised concentration of Staph. aureus. The plates were allowed to air dry. Circular wells of a standard size were cut into the agar culture media and filled with equal amounts (lOOμl) of cream or solution. Antibacterial activity was determined by measuring the zones of inhibition forming around each well. Oxford Staph. aureus produced a zone size of 35 mm. 5 strains were identified as being fully susceptible (33 mm to 45 mm zone sizes), 12 showed intermediate susceptibility (zone sizes between 12 mm and 23 mm) and 13 strains were resistant (no zone of inhibition). An aqueous solution of allicin liquid was shown to be highly active against all strains of Staph. aureus tested down to levels of 250 ppm, (Figure 1). When made up in a typical aqueous cream, allicin was found to be highly active against all strains at concentrations of 500ppm . These concentrations are at acceptable levels for use as a topical agent (Figure 2). PHASE 2 Minimum inhibitory concentrations (MIC) and Minimum bactericidal concentrations (MBC) for Allicin against Stayhylococcus aureus. Seventeen clinical isolates, (selected from the phase 1 group of strains) and one control strain (Oxford Strain, NCTC 6571) of Staph aureus were tested. Each strain was cultured overnight at 37°C in Muller-Hinton broth (Oxoid Ltd. CM405). The cultures were diluted in this broth to give a concentration Log 7 cfu/ml, ten times the final concentration to be used. 2ml of an aqueous solution of allicin (at a concentration of 5000ppm) was added to 8ml of Muller-Hinton broth (broth concentrated to avoid media dilution effect) and double diluted to give a range of concentrations between 1000 ppm (μg/ml) and 1 ppm (μg/ml) plus a 0 ppm (μg/ml) negative control. One ml of each mixture was removed from each broth and 1 ml of the bacterial concentrate added, giving a final concentration of approximately Log 6 cfu/ml. These broth cultures were incubated overnight at 37°C. The next day broths were examined for growth (cloudy cultures). The lowest concentration showing no growth (clear) was taken as the MIC. The culture containing the MIC and all concentrations above it were sub-cultured onto Nutrient agar plates (Oxoid Ltd, CM3) to determine the MBC. 0.1ml of each culture was removed and cultured. The highest concentration showing growth (cloudy) in the MIC test was also sub-cultured as a positive control. Plates were incubated overnight at 37°C. The highest concentration showing growth (bacterial colonies visible) was taken as the MBC. To formulate a cream or solution for clinical use against Staphylococcus aureus it is important to determine the optimum concentrations of anti-microbial agent which show activity against the test strains. The results are collated in Table 4 infra. The control strain tested (the Oxford Staph aureus) gave an MIC of 32 μg/ml and an MBC of 256 μg/ml. The MICs for the 17 clinical isolates tested were either 16 or 32 μg/ml the MBCs were either 128 or 256 μg/ml. 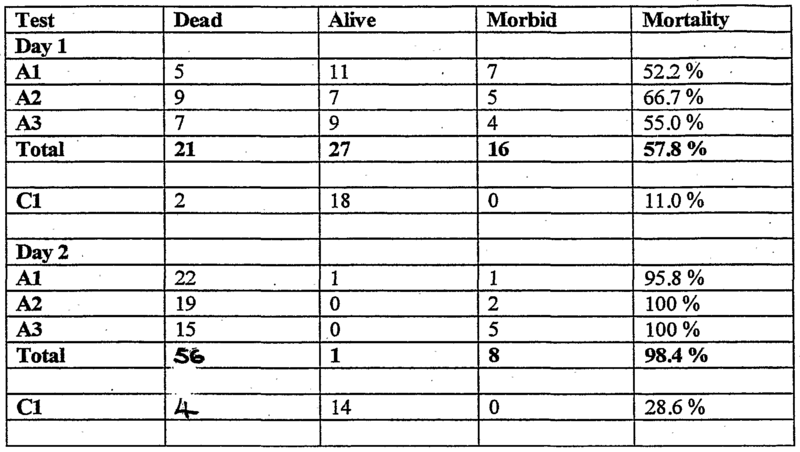 The majority of the clinical isolates had MICs of 16μg/ml and MBCs of 128 μg/ml, see Table 5. The activity of 500ppm and lOOOppm of allicin corresponded with that of a 1 in 10 and 1 in 5 dilution of a crude garlic extract. 88%o of strains had Minimum Inhibitory Concentrations for allicin of 16 μg/ml and 100% of strains were inhibited by allicin at 32 μg/ml. 88%) of strains had Minimum bactericidal concentrations for allicin of 128 μg/ml and 100% of strains were killed by allicin at 256 μg/ml. Allicin is highly effective against allicin is highly effective against both characterised and wild strains of MRSA. Salmonella typhimurium (rods) Pseudomonas aeruginosa (rods) Escherichia coli (rods). Oxoid Isosensitest agar media was autoclaved and cooled to approximately 45-50°C prior to use. Serial dilutions of 5000ppm aqueous allicin (Allimax) were made in Isosensitest broth. 2ml of each dilution of allicin were added to each sterile petri dish (each test was performed in duplicate). 18ml of the cooled media was added to the allicin and mixed, and allowed to cool and solidify. Bacterial species were prepared at inocula of 106 cfu/ml and 0.02ml inoculated onto each plate using a multipoint innoculator. Negative controls were included in each batch. These tests showed that the existence of a range of MICs between selected species of Gram positive and Gram negative bacterial species, the most susceptible species being the staphylococci, having an MIC of between 15 and 41ppm. The most resistant Gram negative species was Pseudomonas aeruginosa (MIC 378ppm) and the most resistant Gram positive species was the rod Serratia marcescens (MIC 170ppm). Allicin liquid extracts were highly active against clinical isolates of multiply antibiotic resistant Staphylococcus aureus, including those strains which were identified as mupirocin resistant. Cream formulations showed acceptable levels of activity at 500 μg/ml to support the use of allicin cream as a topical agent against mupirocin resistant and mupirocin susceptible strains of multiply antibiotic resistant Staphylococcus aureus. Following analogous methodology, similar trials were then conducted to compare the effectiveness of allicin with that of streptomycin against six strains MDRTB (multiply drug resistant tuberculosis). The results are shown in Table 7. In the presence of an antimicrobial, any growth of mycobacterium tuberculosis is highly significant. As is very clear from these results, whereas growth was noted on all slopes where strains were treated with streptomycin, no growth was found on any of the slopes treated with allicin (aqueous solution at a concentration of 500ppm). Further investigations were then made into the insecticidal properties of allicin, in particular, its pediculicidal activity against head lice (Pediculus humanus). Control of head lice infections has traditionally been performed using conventional insecticides with some success. However, in several parts of the world, strains of head lice have developed which are resistant to one or more of these insecticides. In the trial, adult male and female lice were used in approximately equal numbers. The lice were fed on the morning of the test and allowed a minimum of four hours to recover, during which time they were able to excrete excess water imbibed with their blood meal. Lice were counted into batches of twenty and were provided with squares of open meshed nylon gauze (tulle) as a substrate upon which to stand. Each batch was allocated to a marked 30 mm plastic petri dish. An aliquot of approximately 5-10 ml of allicin at a concentration of 5000ppm in aqueous solution was poured into the base of a clean 30mm plastic petri dish. The gauze bearing the lice was immersed in the fluid for 10 seconds, during which time the gauze was turned at least twice to ensure removal of air bubbles. After removal from the fluid, the gauze and insects were lightly blotted to remove excess fluid and returned to their marked petri dish. The procedure was repeated for the other replicate gauze squares in that batch. Gauze squares bearing the lice are incubated under normal maintenance conditions (30° ±2° Cand 50% ± 15%) elative humidity) overnight. At the end of the exposure period, the insects and gauze were washed using a bland toiletry shampoo (Boots ® Frequent Wash Shampoo), diluted one part shampoo to fourteen parts water, after which they were rinsed three times using 250ml warm tap water (34°C) poured through and over the gauze squares. The gauze squares were then blotted dry using a medical wipe tissue and incubated under normal maintenance conditions in a clean plastic petri dish of the appropriate size for one hour. A blood meal was provided. The lice were left for four hours to recover before being treated once again as above. The results for three trials are shown in Table 8 against control batches treated with 60%> isopropyl alcohol, at 24 hours and 48 hours. As can be seen, allicin shows reasonable effectiveness overnight with an overall mortality of 51.8%, compared with that of the control of 11%>. However, after a blood meal and a second treatment, the effectiveness of allicin becomes 98.4% against the control of 28.6%. 2. Synergistic effects of allicin in combination with other antimicrobial agents. To evaluate the activity of the present applicant's allicin against control strains and clinical isolates of Staphylococcus aureus and Escherichia coli, we screened with a wide range of antibiotics using plate diffusion methods against antibiotic resistant and antibiotic susceptible bacteria. Oxoid Isosensitest media (ISA, CM471, Oxoid, Basingstoke,UK) was used. This media is recommended for antimicrobial susceptibility testing by the British Society for Antimicrobial Chemotherapy (BSAC). The methods prescribed by the BSAC (BSAC, 2001) were used. For each test run, pre-tests were carried out to optimise inoculum, allicin concentration and the distance on the plate between the agents being tested. Bacterial strains: - One antibiotic susceptible control (Staph. aureus, NCTC 6571), 2 Methicillin resistant Staph. aureus (MRSA) and E coli, K12. Antibiotics: - 22 antibiotics were tested; see Table 9. 2. Prepare inocula to produce dense but not confluent growth on standardised 25ml agar plates. Dry plate surface. 6. Evaluate for synergy (coalescence of zones), antagonism (reduction in zone of inhibition) or no effect. Quantify results to select those combinations to be tested in the phase 2 tests. The first set of experiments was to determine if varying the concentration of allicin had any effect on potential synergy. Table 10 shows the interaction of 8 antibiotics with two concentrations of allicin (500ppm and 250ppm). Zone sizes are given in mm. Staph. aureus: The zone sizes for 250ppm of allicin were between 5 and 9 mm smaller than those for 500ppm. E. coli: The zone sizes for 250ppm of allicin were between 1 and 12mm smaller than those for 500ppm. In general the zone sizes were smaller than those achieved with Staph aureus. 500ppm was selected for further tests as the area of interaction between allicin and the antibiotic was greater. 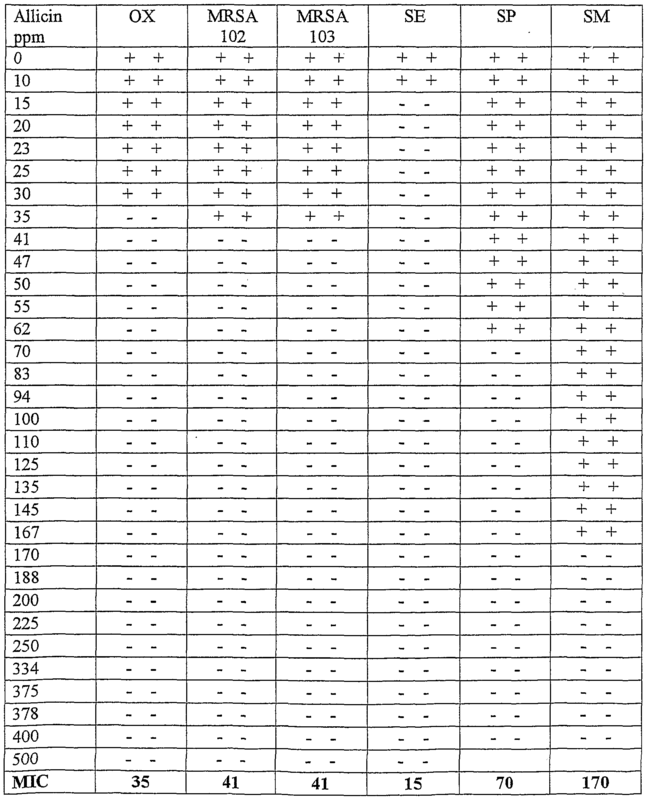 Also there were no inconclusive results produced using 500ppm but there were using 250ppm (Table 10 -results marked "?") The results shown on Table 9 demonstrate the antibiotic combinations selected for further studies. Twelve combinations were selected all of which had grade scores of greater than 5. Combinations with scores above 5 not selected contained antibiotics belonging to a group already being tested (eg aminoglycoside group). Gentamicin and tobramycin were both selected because of their common usage in treating patients and their high grade scores. Table 9 shows the results of a study of the comparative synergistic activity of 22 antibiotics with 500ppm of Allicin. The grade scores related to the possible degree of synergy as determined using agar diffusion tests. Although the antibiotic susceptible control strain (Oxford) showed the greatest number of high grade scores, the MRSA strains also showed good potential and there was also potential synergy for tetracycline with E coli. Figures 5 to 9 demonstrate how the different synergy interactions were graded. The present trials clearly demonstrate the potential for antimicrobial synergy for allicin and a wide range of antibiotics against Staphylococcus aureus including MRSA. 500 26 48 S 25 43 ? 32 45 S 10 45 ? MRSA 103 250 28 40 S 0 40 N 18 40 S 30 39 ? Chloramp - chloramphenicol; Eryth- erythromycin; Fus acid - fusidic acid; Meth- methicillin; Novob- novobiocin; Pen G- penicillin G; Strep-streptomycin; Tet- tetracycline. 1. An antibacterial, antiviral, antibiotic, antimicrobial, antifungal, antiprotozoal, insecticidal, larvicidal, ovicidal or pediculicidal preparation comprising allicin or an allicin metabolite and a pharmaceutically acceptable excipient. 2. A preparation as claimed in Claim 1 further comprising at least one further antibacterial, antiviral, antibiotic, antimicrobial, antifungal, antiprotozoal, insecticidal, larvicidal, ovicidal or pediculicidal. 3. A preparation as claimed in Claim 2 wherein the further agent is selected from (i) penicillins, (ii) aminoglycosides (iii) tetracyclines; (iv) macrolides (v) cephalosporins and cephamycins and (vi) fusidic acid, rifampicin, novobiocin, vancomycin, ciprofloxacin, chloramphenicol or metronidazole. 4. A preparation as claimed in any one of Claims 1, 2 or 3, wherein the allicin metabolite is selected from DADS (Diallyldisulphide), DATS (Diallyltrisulphide), ajoene, allitridium and vinyldithiins. 5. A preparation as claimed in any one of Claims 1 to 4 wherein the pharmaceutically acceptable excipient is a solid composition onto which the allicin is bound. 6. A composition as claimed in Claim 5 wherein the solid composition comprises a modified starch such as maltodextrin, gum acacia, silica and an emulsifier such as magnesium stearate. 7. A preparation as claimed in any one of claims 1 to 3 wherein the pharmaceutically acceptable excipient comprises a cream or a soap. 8. A cream preparation as claimed in Claim 7 wherein the excipient comprises white soft paraffin, an emulsifier, glycerin, water, yellow soft paraffin and a stabiliser. 9. A preparation as claimed in Claim 8 wherein the emulsifier is a stearate, preferably magnesium stearate. 10. A soap preparation as claimed in Claim 9 wherein the excipient comprises ether sulphate, cocamide and cocobetaine. 11. A preparation as claimed in any one of claims 5 to 10 wherein the ratio of allicin to excipient is such as to provide an allicin concentration of between 1 and 2000ppm, preferably between 50 and lOOOppm, more preferably between 250 and 500ppm. 12. The use of allicin in the preparation of a medicament for the treatment of multiply drag resistant bacteria. 13. The use as claimed in Claim 12 wherein the bacteria is MRSA (methicillin resistant Staphylococcus aureus); MDRTB (Multiply drug resistant tuberculosis); VRSA (Nancomycin resistant Staphylococcus aureus); MRSE (methicillin resistant Staphylococcus epidermidis); PRSP (Penicillin resistant Streptococcus pneumoneae); NRE (Nancomycin resistant enterococci) or VISA (Vancomycin intermediate resistant Staphylococcus aureus). DE4012884A1 (en) * 1990-04-23 1991-10-24 Lichtwer Pharma Gmbh Garlic extracts contg. alliinase - have improved therapeutic activity for treating hypertension, arteriosclerosis, diarrhoea, intestinal worms etc. Kim et al. 2006 Antibacterial and antifungal activity of sulfur-containing compounds from Petiveria alliacea L.